In the aftermath of their 2013 Stanley Cup Championship victory, the front office of the Chicago Blackhawks were faced with the challenge of keeping their core talent in tact going forward, unlike in 2010, when the team was forcefully dismantled in the wake of a championship due to salary cap restrictions. General Manager Stan Bowman had more flexibility this time around with the cash, so he was able to breathe a little easier this off-season while saying goodbye to only a couple smaller pieces of the championship puzzle — Dave Bolland, Michael Frolik — in the immediate rush of the free agency period. As things died down and we got closer to the start of training camp, a key decision that came to Bowman was to extend the contract of starting goaltender Corey Crawford, to whom he gave an additional six years and $36 million dollars at the beginning of this month. Some NHL observers had questions at the ready when this move broke the news, such as Ryan Lambert of Yahoo Sports blog Puck Daddy — can Crawford hang in for the long haul? Did he receive the contract too soon? Etc. Throughout his career, Crawford has proved his critics wrong and last season was no different. While sharing games with backup Ray Emery last season, Crawford posted his best season of his career with a 19-5 record and a .926% save percentage along with a 1.94 goals against average. After struggling in the 2012 season, which ended so disappointingly in the playoffs against the Coyotes, Crawford showed his true colors this past season by putting on the best playoff run in franchise history (16-7 record, .932 save percentage, 1.84 goals against average). Allowing no time to Emery in the postseason, despite some cries in the media to do so, the Hawks allowed Crawford to prove that he was a stellar goalie, making key saves and not allowing many bad goals despite being tested continuously by the Detroit Red Wings, L.A. Kings and in the Finals against the Boston Bruins. Crawford should have been the Conn Smythe Trophy winner (Playoff MVP) but his remarkable run will never be forgotten, nonetheless. People forget that when coach Joel Quenneville took over the team early in the 2008-09 season, the starting goaltenders were a main problem and needed to be fixed. A laundry list of names went through the position: Cristobal Huet; Antii Niemi; Nikolai Khabibulin; Marty Turco and Emery. With the exception of Niemi in 2010, the other goalies lacked consistency in their play. The real question going forward is will Crawford maintain consistency and firmly cement himself as one of the top goalies in the NHL? Time will tell, but I believe that he can. Crawford seems to have learned from his past mistakes, playing more mentally tough as of late and making tough saves to keep the Hawks in games. At 28, the sky’s the limit for Crawford and he has earned the right to be in the position he’s in now. There are other starting goalies who have been at it much longer than Crawford, but many of them have not even sniffed at a Stanley Cup appearance, let alone a Stanley Cup Championship. 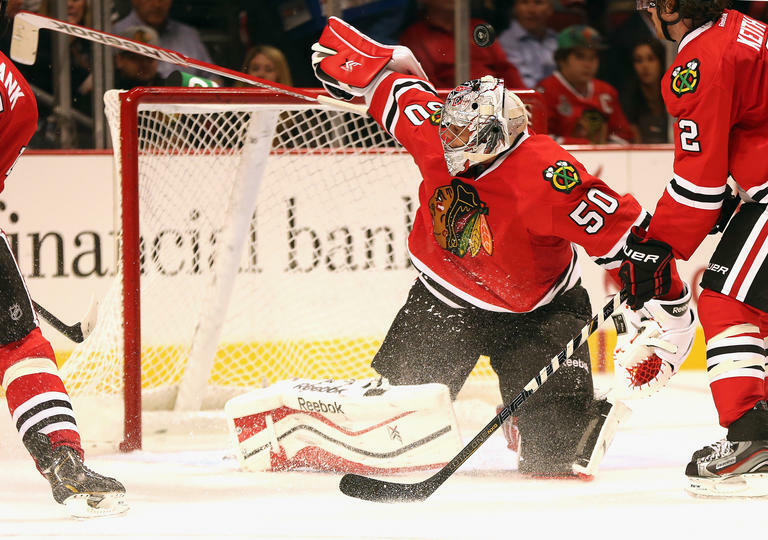 Who among the goaltenders in the NHL wouldn’t want to trade places with Crawford right now? Entering his second season in the NHL, the Hawks’ Brandon Saad was initially asked to fill a role playing center on the team’s second line. Second line center has been a position that the Hawks have struggled with in recent years, with the exception of Patrick Sharp’s play in 2010. Saad, a Calder Trophy candidate (Rookie Of The Year) in 2013, is coming off of a tremendous year in which he posted 27 points (10 goals, 17 assists), most of those numbers came playing on the first line with Jonathan Toews and Patrick Kane. As the playoffs arrived, Saad struggled and was demoted to the third line and wound up posting just one goal and five assists. In bringing Saad to center from his long-played wing position, the idea seemed to be to jumpstart his upcoming season, the experiment ended this weekend. Also, Saad was placed at center for the time because of other injuries, always a indicator that this is a move that can be reversed should other factors kick in. 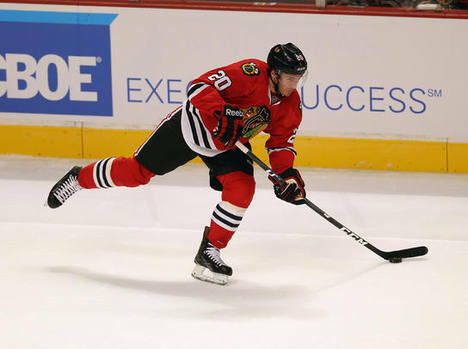 Moving Saad back to his natural position will help his development as far scoring goals. Whether on the first line or the third line, Saad must now show that he can be consistent with his play. I don’t see Saad moving back to center unless there’s a rash of injuries.